After having been in temporary accommodation for exactly a year now, with half to two-thirds of my kitchen in storage, we’re finally looking at moving into a permanent house in a couple of weeks’ time. I’m so looking forward to being able to play in the kitchen again. Amongst other things, I managed to put into storage all my bread tins, so have been experimenting with some glass cookware (that I rarely used before, but somehow ended up taking with us). 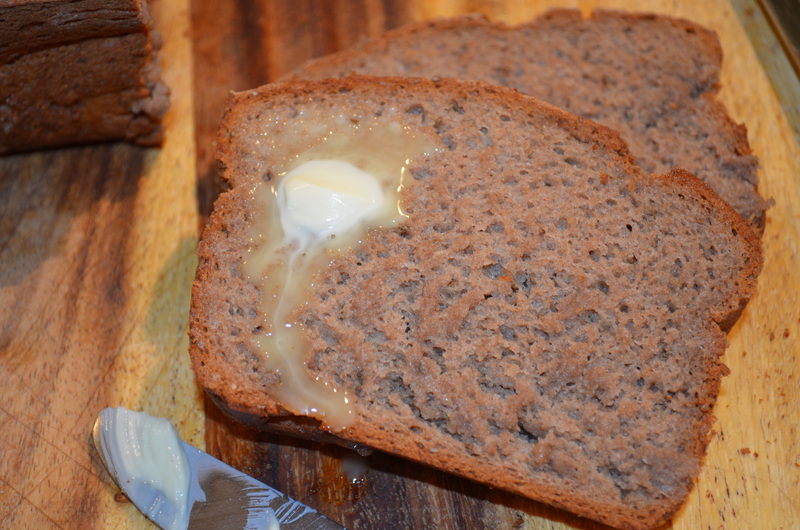 Making gluten free bread with eggs is now pretty straight forward, but getting a good rise out of a vegan bread mix has been more challenging. This slice was cut before the loaf had fully cooled, but note the lack of unleavened bread at the bottom of the loaf! I was toying with my copy of Gluten-Free and Vegan Bread by Jennifer Katzinger (with which I’ve had limited success) a few months ago, when I realized that the logic that she was using for not waiting for the dough to rise before putting it in the oven, could be applied to what I used to do sometimes with wheat bread. Sometimes, I would only wait until the dough was mostly risen, then put it in a cold (but heating) oven so that the slowly rising heat from the oven caused the yeast to go mad, right up until the point that it got hot enough to cook. Jennifer puts her bread straight into a hot oven, but I wanted to experiment putting the dough into a cold oven, so that it only had 15 minutes of rising before cooking at a reasonably high temperature. It seems to me that we still need a certain amount of yeast action to raise the loaf, but (according to Jennifer) we don’t want enzymes to have time to break down the structure, so we’d best be using lots of first generation yeast instead of waiting for successive generations to build up the CO2 in our loaf. This means that I’ve used far more yeast than I would normally use in a loaf …. and at this rate, using individual sachets of yeast is an expensive proposition. I buy my yeast in 2 lb bags in Costco for about the same money that I’ve seen charged for a 4 oz jar in other supermarkets. The resultant bread is mildish in flavor (but not bland) with a crunchy crust, and a soft, moist mie the texture of REAL bread (as opposed to the pointless, fluffy-white-nothing of mass-produced ready-sliced modern wheat bread, of which I was never particularly fond). The tapioca starch keeps the texture of the mie soft; the almond flour gives a mild but nutritious aspect; the bean flour is great for nutrition and structure (but tends to be rather strongly flavored which is why I’ve diluted it with other flours), and the teff flour is also nutritiously superior, but with a warming, mellow flavor. I think it’s the teff that gives the slight molasses (not sweet) flavor that my daughter noticed. All in all, I really like this loaf. 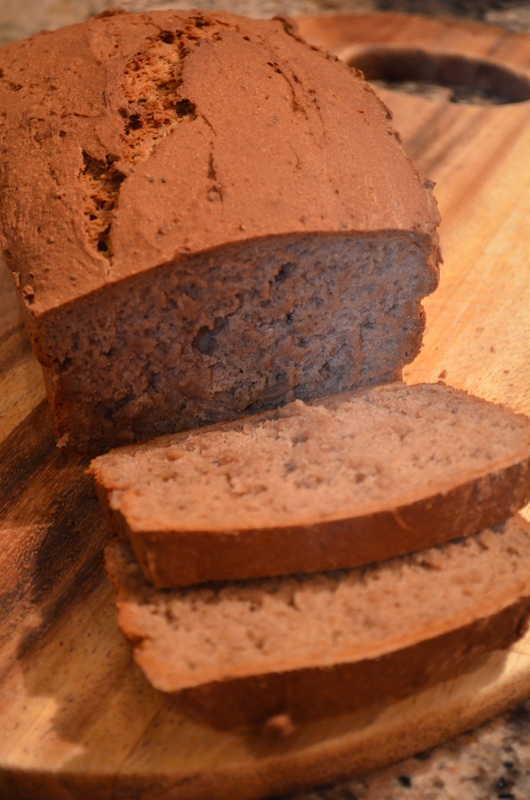 It isn’t as calorie dense as my much loved almond bread, but has good structure and flavor and isn’t reliant on eggs. 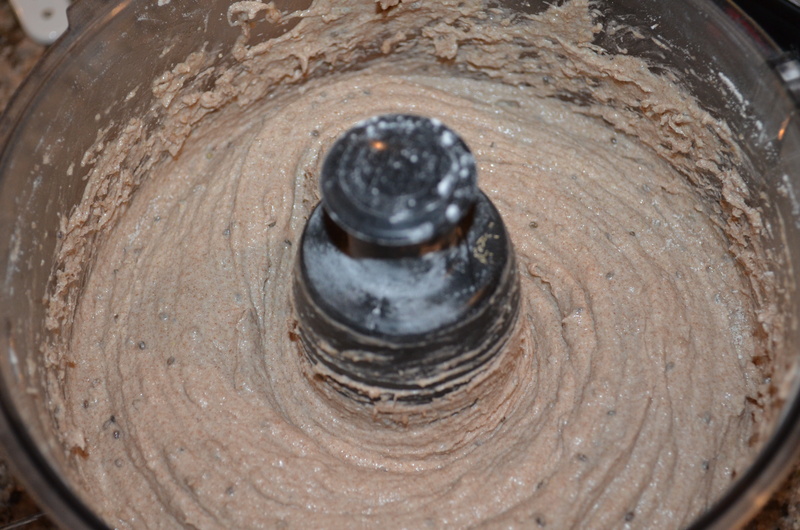 Into the food processor, put the starch, almond, bean, and teff flours. Add the salt, xanthan gum, oil, and yeast. Once they’re ready, add the soaked chia seeds to the processor (the mixture will have thickened). Start processing the mixture and slowly (~10 seconds) add the water/syrup mixture. Process until the ingredients are fully amalgamated (~60 seconds). Add another tbsp or two of water, if your processor is having a hard time mixing this. Heavily grease a 2lb loaf pan, scrape the dough into the pan and smooth the top with a spatula. Cover loosely with a sheet of baking parchment (not foil which increases the cooking time) to avoid over-browning. Place the wannabe loaf in the oven, then turn on the oven to heat up to 360F and cook for 1 hr (from cold). When cooked, the loaf will have pulled away from the side of the pan slightly. Tip it out, and allow to cool (ha ha … I never manage this bit) before slicing.